Hello. 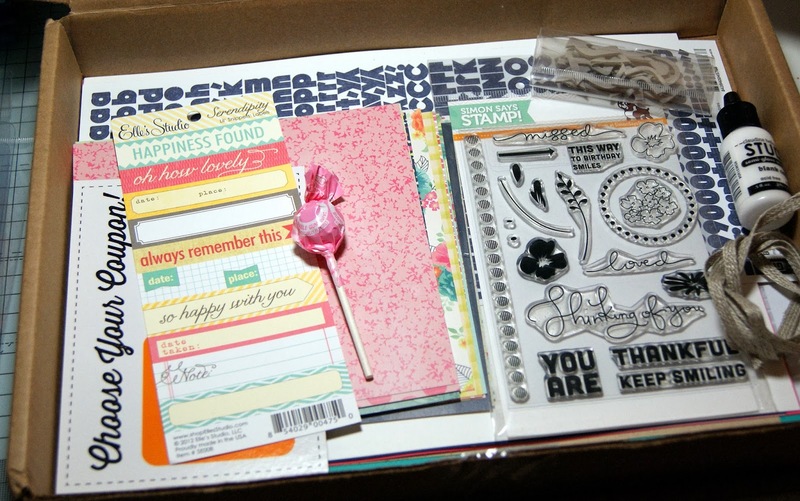 Woohoo, my first monthly card kit arrived from Simon Says Stamp. Full of gorgeous papers, cardstock, embellies and a stamp set. I can't wait to have a play but it won't be for a few days yet as I am super busy with magazine work (I still can't believe how lucky I am). And I gave the lollipop to hubby, well, you've got to pacify them somehow! Looking forward to see what you create with them. I've been considering getting a subscription myself, but I decided against it because of the shipping costs. I did buy two separate kits, though, and I have been wondering what to do with those lollipops. Not sure my husband would like them LOL. Looks amazing Liz, can't wait to see what you make! Can't wait to see what you create with your new kit. Those goodies all look fabulous!